I have made no secret that writing has kept me sane over the past (almost) year, when things became really bad between barely husband and I. Starting to record a story I had in my mind, a story I wanted to maybe share one day, I used pen and paper. A couple of months into it, when I reached out to my daughter because I realised she wasn’t in a good place, we bonded as friends and I shared my writing with her and she introduced me to Wattpad. 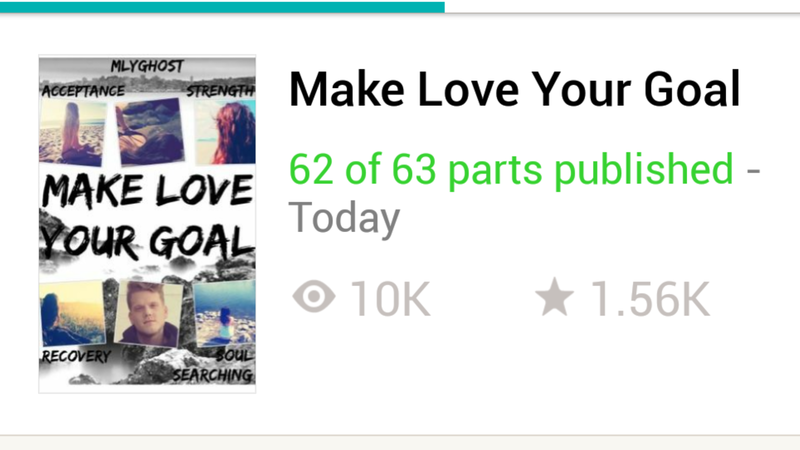 She has been my biggest supporter and it was with her that I celebrated my latest milestone: 10K reads of my little story about love and acceptance. Make Love Your Goal is my dream, an attempt to tell a story about people who live, love, hurt and fight for what’s right. Sexuality and sexual orientation are still taboos in this day and age and I navigate through some not so travelled paths to get my message across. The story is still far from a blockbuster but it has found its public, with a lot of readers, many very young ones, thanking me for the way I approach the subjects. I am very happy with it and I will keep writing! Click on the title to access. It’s completely free to read! Thank you so much! You are part of this. You kept me going when I wanted to delete the whole thing. Hugs! Awe thank you and you are very welcome. I’m glad you are still here and didn’t delete. ❤ hugs to you.